Home » Latest News For Adults » Yay, comics! The "Grown Up" edition..
Yay, comics! The "Grown Up" edition.. 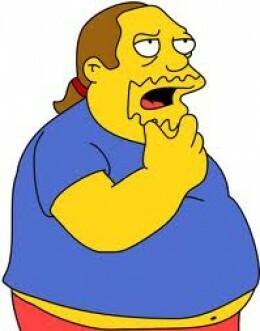 Worst Library comic blogger evah. Apologies for the lack of recent comic book content recently. Lets things back into gear! We’re looking at some of the recent additions for the more discerning elderly comic reader today. One who is a bit more sophisticated and enjoys comics with complex themes, characterisations and intricate and involved plot dynamics. Which of course means I haven’t read any of them. You know whats nice? Whats nice is to talk about a comic series that you can borrow in its entirety from us at Cockburn Libraries. From the very beginning to the very end! Y’know, that’s kind of rare in serialized fiction. You know what else is nice? When the series is good. 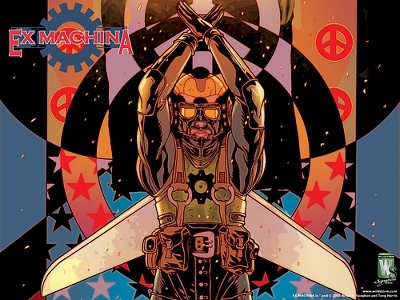 Ex Machina is a series published under the Wildstorm banner at DC comics, a more mature imprint, and is created by Brian K Vaughan( Y: the last man, Runaways) and Tony Harris(Starman). It ran for 50 issues, won the Eisner award for Best New Series in 2005 and we have all of the oversized hardcover collections! Yay us! But what is it about I hear you ask? Superhero Politics. No wait – not quite. Ex Machina is about MItchell Hundred, the recently elected Mayor of New York City who also happenned to be the worlds first and only superhero. It deals with the mysteries of how he got his powers plus details his life in the world of politics. It’s a unique series and well worth a look. Click here to reserve them now. Another series that is highly regarded is DMZ. 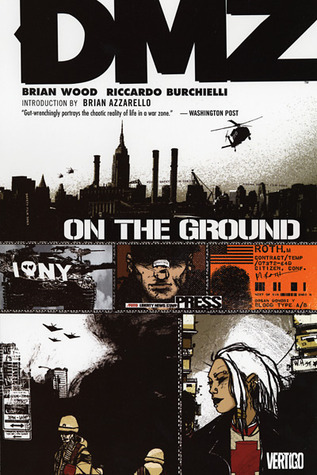 A Vertigo title (which means there is mature content to be found within) tells the story of the near future where a second civil war has broken out in the US and is set mostly in Manhattan which has been designated a demilitarized zone. Again not enough capes or Kirby Krackle in here for me but check it out if you like modern war stories. We have the first 3 volumes and they can be found HERE. I dont even know what i can say about this without the library collapsing in of itself. The boys USED to be published by DC comics and it parodied various archetypal superhero characters in quite a mature, adult fashion. Too mature and adult – DC decided that it wasn’t for them and cancelled it. It’s since moved to Dynamite where it’s still going strong. I suppose I should mention what it’s about? 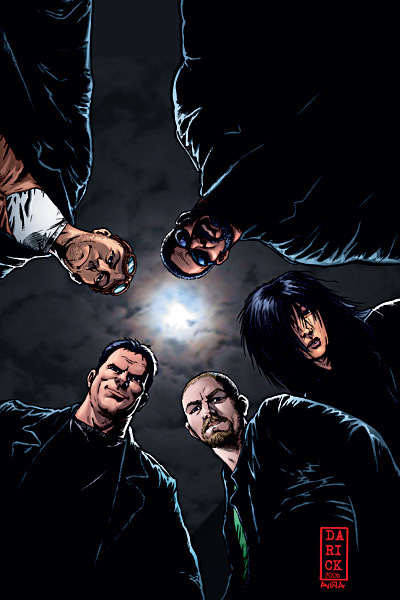 A group called The Boys exists to police the superhero community who are a bit…reckless shall we say? In a nutshell. A popular series which has its fans but be prepared! Click here to reserve Volume One! NextYay, Comics – The Runaways it started off well..edition. I adore The Boys! I’m a latecomer to the series and they were introduced to me by a colleague when I was looking for graphic novel recommendations during our library’s Comic Book Month celebration in 2011 (Auckland Libraries). I felt that they addressed an issue that I’d always had in the back of my mind when reading other superhero stories…who keeps the superheroes in line? Nice post! Hey Tosca, glad you like it! It’s a little too grown up for me I’m afraid but I know it’s well liked. A bit of a cult hit it seems. Comic Book Month celebration? I should get out to Auckland Libraries more often..